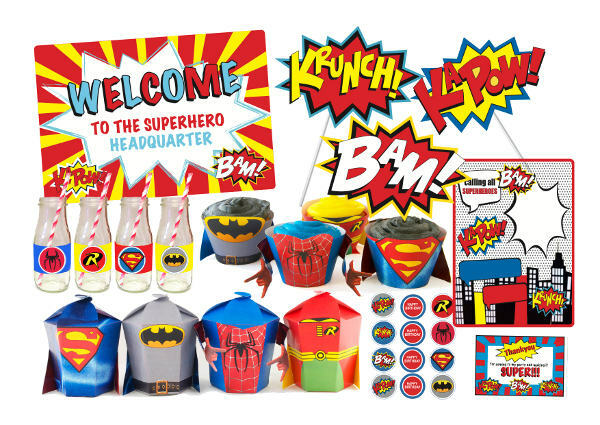 Looking to add a bit more “super” into your superhero party? The fantastic printables from The Quirky Quail will give you the power! I love a good superhero party, all bright, primary colours and kids running around in capes. They really are one of those quintessential children’s birthday party experiences. The best part is that it doesn’t take much for your party to become a superhero party – just throw a Batman costume on the birthday child and make sure there’s enough room for everyone to run around like lunatics. If you really want to take it to the next level though, you must check out the printables available at The Quirky Quail. All you need is a colour printer and you’ll be well on your way, with cupcake toppers, gift boxes, cake wrappers and various other signs and tags to add a bit of BAM! to your next party. You simply buy the PDF which is delivered straight to you by email, and then print it off. As long as you’re handy with a pair of scissors and not opposed to spending some time folding things, you’ll have a super (and original) party ready to go in no time. The Quirky Quail has lots of different listings that allow you to purchase for instance, a single style of cupcake wrapper (just $4) right through to the great value Ultimate Superhero Party Pack ($15) which includes all the basics as well as invitations, thank you cards, signs and even party props. All the top-tier superheroes are represented, so check out The Quirky Quail on Etsy for that little bit of KAPOW! that your party has been lacking!